Round about the time Peter Capaldi was stepping out of the TARDIS for the first time, making dwarf jokes, I was sitting in a tent in the middle of Northamptonshire, shouting at my children. This was half by choice. It shouldn’t take a genius to work out which half. We visit Greenbelt every August bank holiday; a vibrant, multicoloured rain-soaked celebration, with logistical problems and mud and the queues for the toilet all forgotten in the light of the afternoon sun as the Proclaimers take to the stage. We’ve been blown away by Bellowhead, dazzled by Courtney Pine and frankly baffled (in the best possible way) by the Polyphonic Spree. One year we almost saw Gil Scott Heron, except he didn’t show up, and then inconsiderately died before they could re-book him. But camping with small children is no picnic. It’s not so bad when it’s warm and they can run around outside. In Kettering it was cold, particularly at night. It’s not long before the silliness sets in and the tent becomes one of those impromptu bouncy castles, the soft walls given a new lease of life in games of tag. We spent an hour getting the damned thing erect, having inexplicably started from the wrong end after years of doing this and discovering, all too late, the optimal, argument-free method for putting it up and getting it down the very week we deem it no longer fit for its intended purpose. Meanwhile the kids are ripping down the sleeping compartment and there is water on the floor from the hole in the roof, despite my other half’s best efforts with the gaffer tape. (She is the seasoned camper with all the knowledge; I help where I can.) Oh, for a portable structure that’s bigger on the inside, like that tent in Harry Potter, or…sorry, there was another example of this, but it escapes me now. Our regular Greenbelt attendance also means that for two years out of the last four, I’ve missed the opening episode of a Doctor Who series. This year I came close to actually watching that leaked version, realising after a couple of minutes of viewing the black and white footage that it frankly wasn’t worth it. It’s said that good speakers can improve a poor song, or at least mask its inadequacies, but I really didn’t want to experience Capaldi’s debut without all the bells and whistles that would make it bearable. But the Greenbelt audience has its fair share of Doctor Who fans as well. This (not taken by me) is a good start. 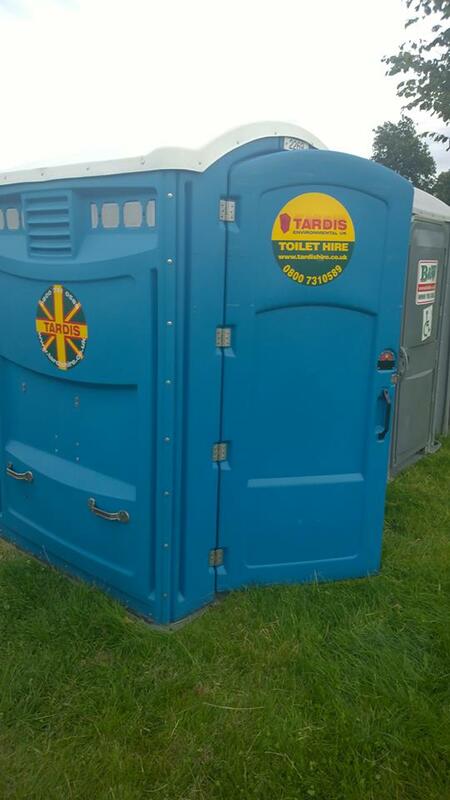 There are assorted TURDIS jokes I could make here, but dedicated fans will appreciate the irony of sticking this on a portaloo, given in 2001’s ‘The One Doctor’ – featuring a false Doctor (Christopher Biggins) who travels through time and space in a toilet. You can guess the materialisation sound. Back in 2005, Paul Cornell visited. I didn’t see him, plumping instead for Philip Purser-Hallard talking about ‘The Spirituality of Doctor Who’ – the sort of phrase that typically fills me with dread, but he spoke with expertise and panache (“A character significantly named ‘Adam’ is falling from the Doctor’s grace after he gives in to temptation, by a woman, to partake of forbidden knowledge”) and managed to argue, quite convincingly, that the Eccleston series wasn’t nearly as pro-atheist as many believed. It was an informative hour capped by an entertaining Q&A session in which, having listened to all sorts of theories about deus ex machina and liberal Christianity, a young boy stuck up his hand and got a near standing-ovation when he asked “The episode with the children with the gas-masks – what does that have to do with the Bible?”. And have a nice picnic on the rug”. 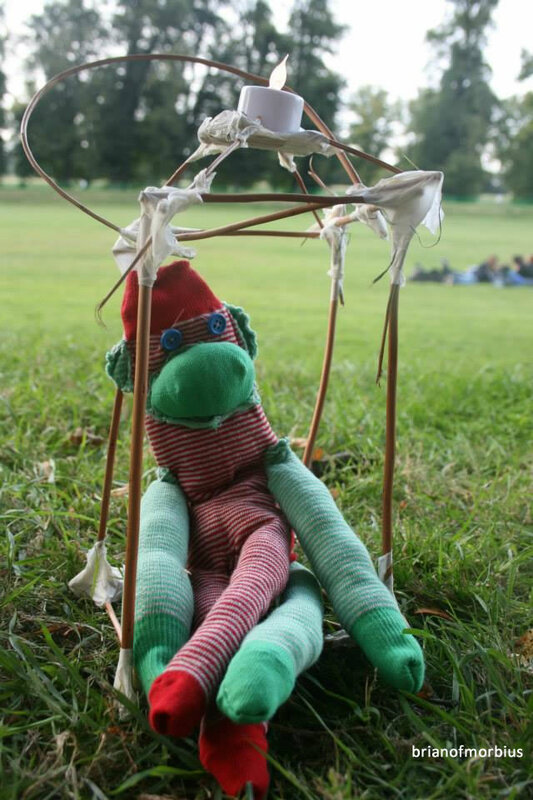 We were down at the Make and Create tent for an entire day, as Emily made sock monkeys and built bamboo lanterns for a procession that was cancelled. We could think of several names for the Make and Create tent, but there may be minors reading this. Trust my children to pick the most complicated crafts – never mind the fact that none of the crafts were suitable for all but the most dexterous of children (sewing? Really?). Not that I’ve ever enjoyed arts and crafts, as a child or an adult. Give me a box of Lego bricks and I’m happy for hours, but when you have three children with the attention span that ours have, you don’t get beyond the first gluing exercise before the eyes begin to glaze over. You find yourself scouring the room for something sharp enough to punch a hole through a plastic lid, because the scissors are too rounded and in any case the little girl with the purple dress and the pigtails has been hogging them for FIFTEEN MINUTES while she cuts out paper doilies. You’re trying to glue the end of a toilet roll to a cardboard box but it won’t stick, so you switch to sellotape, but that doesn’t work because the end is stringy and won’t unpick because you clipped your nails that morning. The yellow felt tip has run out and the orange is nowhere to be seen, and your children have been drawing on their hands because they’re bored. But you want to see this through, because you’ve started and you’re damn well going to finish. And then it’s not a junk modelling session anymore; it’s a quest, and you don’t care if your kids are now running riot by the Stickle Bricks – you will, darnit, you will finish this robot you’ve started to make, with or without their help. Having spent four hours (continuously) sewing sock monkeys, Emily decided to make a lantern for Thomas, and she decided to give it a TARDIS shape. This was after realising that one of our completed sock monkeys appeared to be wearing a fez. Anyway: all this meant that we weren’t here for ‘Deep Breath’, but that’s OK, because that’s why we have catch-up (“And please, just learn to use iPlayer!”). But here’s the funny thing – having showered and unpacked a bit and got the children into bed so we could watch the episode in peace without the barrage of questions we’d be unable to answer because it’s too early in the arc – after all that, ‘Deep Breath’ was in many ways quite similar to the festival we’d just experienced. Because we spent a year waiting for it, and talking about it, and arguing with people online as to whether the big changes were going to mean it would be a success or a disaster. And there were people saying that change had always been a part of it, and that they could remember the days when things were very different, and we should all be grateful that it was still going. But when it actually came to the episode, it took ages to get everything set up, the children got bored, half the time we couldn’t hear what anyone was saying because it was accompanied by deafening music, and while there were moments of beauty and wonder, we realised by the end that we’d had to wallow through a lot of crap to get to them. And next year, I’m buying a camper van.